February 2012 – OpenTech Alliance, Inc.
PHOENIX, Arizona – February 28th, 2012 – OpenTech Alliance, Inc. announced its INSOMNIAC software is now available over the Internet. OpenTech has leveraged 8 years of experience in completing unattended rental transactions to develop INSOMNIAC Online. The INSOMNIAC software that rented over 22,000 units last year on kiosks now runs in the Self Storage Cloud and rent units over the internet and on mobile devices. INSOMNIAC Online integrates with all the leading property management software programs, so operators have the freedom to select the software that best suits them and if they decide to change programs they do not have to spend thousands of dollars to redevelop their web and mobile site. “I feel innovation that makes a real impact is based on a broad range of experiences, opinions, and beliefs, so we enjoy listening to self storage operators and collaborating with them to help us develop solutions to their unmet needs. The team at Infinite are definitely thought leaders and they played a significant role in the development of this new service”, commented Robert A. Chiti, OpenTech President and CEO. INSOMNIAC Online will allow consumers to rent units in real-time, make payments, sign up for tenant insurance, update accounts, access gate codes and much more. The service also includes integrated fraud detection to ensure the identity of the new tenant. Self storage operators will no longer have to settle for just getting reservations online that are little more than sales leads, now they can actually close the deal and collect a full month’s rent immediately. Optionally, facilities with a kiosk can have the consumer use it to sign their lease, provide a fingerprint, scan their driver’s license, purchase a lock and if the gate code was not provided during the online rental process, it could be provided at the kiosk. Consumers can also get personal assistance from a remote Storage Counselor thru the kiosk, if needed. For security purposes the entire transaction is digitally recorded. INSOMNIAC Online is one of OpenTech’s new cloud based computing services and is licensed on a pay as you go model. Contact an OpenTech Business Development Manager to start renting units online. OpenTech is a sponsor of the 2012 SiteLink User Conference on March 13 at Bally’s Hotel and Casino and will exhibit at the ISS World Expo on March 14 – 16 at booth numbers 525, 527 and 529. OpenTech’s innovative solutions increase revenues, reduce operating costs and improve customer convenience for self-storage businesses. Their solutions include 7 models of INSOMNIAC self storage kiosks ranging from $5,500 to $18,000, INSOMNIAC Live! call center services ranging from $25 to $450 per month and the INSOMNIAC Self Storage Network for online storage reservations and rentals. For more information on OpenTech, please visit OpenTechAlliance.com or call (602) 749-9370. PHOENIX, Arizona – February 22nd, 2012 – OpenTech Alliance, Inc. announced it is creating the industry’s first self storage specific cloud based computing platform. The Self Storage Cloud will be an “open” architecture that hosts a multitude of integrated software applications and services from different vendors designed to help self storage operators lower their operating costs and increase their revenue. PHOENIX, Arizona – February 9th, 2012 – OpenTech Alliance, Inc. announced today that it has exceeded the $70 million mark in rental fees collected by its INSOMNIAC™ kiosks. Approximately $21 million was realized in 2011 by self storage operators throughout the U.S. and Canada. In an ongoing effort to be a transparent company, OpenTech has released these detailed kiosk usage numbers giving the self storage industry the opportunity to see firsthand how consumers are benefiting from an on-site self service option. The complete 2011 Kiosk Usage White Paper is available for down load at the company website or by clicking here. During 2011, consumers used INSOMNIAC kiosks to rent 23,331 storage units, make 193,574 payments, and purchase 11,502 locks representing a total of $21.3 million in self service transactions. 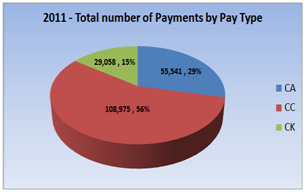 The two tables below illustrate the transactions of new rentals and payments made throughout 2011. In 2011, on average INSOMNIAC kiosks rented 4.3 units per facility per month. OpenTech attributes this 26.4% increase in rentals to the Live! Megan service, offered at no additional charge, as part of the monthly Maintenance and Warranty Service (MWS) program. “Our stated goal is to achieve 6 new rentals per kiosk per month, as you can see we are already getting close. At the ISS Expo in March, we will be demonstrating our new two way video service that offers kiosk users the personal touch of an on-site Assistant Manager, which we believe will help us exceed our goal. Stop by and visit us at booth # 525,” said Robert A. Chiti, President and CEO of OpenTech. OpenTech has developed a Success Guide of “Best Practices” to help self storage operators get the most value from their kiosk. By leveraging these proven best practices, the top 100 performing kiosks processed 97,745 total transactions alone; this includes rentals, reservation completions, payments and merchandise purchases. These kiosks are already averaging over 8 new rentals per month per facility. OpenTech’s kiosks never take a day off, a huge benefit for customers needing to rent a unit or make a payment on a holiday. In 2011, INSOMNIAC kiosks rented 567 units on holidays when most self storage facilities without a kiosk rented 0 units because they were closed. In total, the kiosks collected $567,311 in rental fees during the 11 major holidays proving self storage customers are active people that want to do business at their convenience. The pie chart to the left illustrates how customers pay when they use a kiosk. With all three forms of payment being used, the need for providing consumers with an on-site payment option that supports all forms of payment is a must and a competitive advantage. While credit cards are the preferred method of payment, checks and cash still make up almost half of the total payments. OpenTech products and services increase revenues, reduce operating costs and improve customer convenience for self-storage facilities. The company products and services include 7 models of INSOMNIAC self storage kiosks ranging from $5,500 to $18,000, INSOMNIAC Live! call center services ranging from $25 to $450 per month and the INSOMNIAC Self Storage Network for online storage reservations and rentals. For more information on OpenTech, please visit OpenTechAlliance.com or call (602) 749-9370.